The JVC KW-V41BT is an aftermarket stereo head unit. Stereo head units are for adding functionality to your limited functionality stock stereo or even upgrading an existing aftermarket stereo system. If you’re unhappy with your stock radio functionality, upgrading to an aftermarket head unit like the JVC KW-V41BT may be a relatively inexpensive way to see noticeable improvement to your stereo system instantly. Your stock stereo may have carry out basic functions like playing AM/FM radio and CDs but upgrading to an aftermarket head unit can expand those capabilities to include things like wireless music streaming, satellite radio and in-dash navigation. 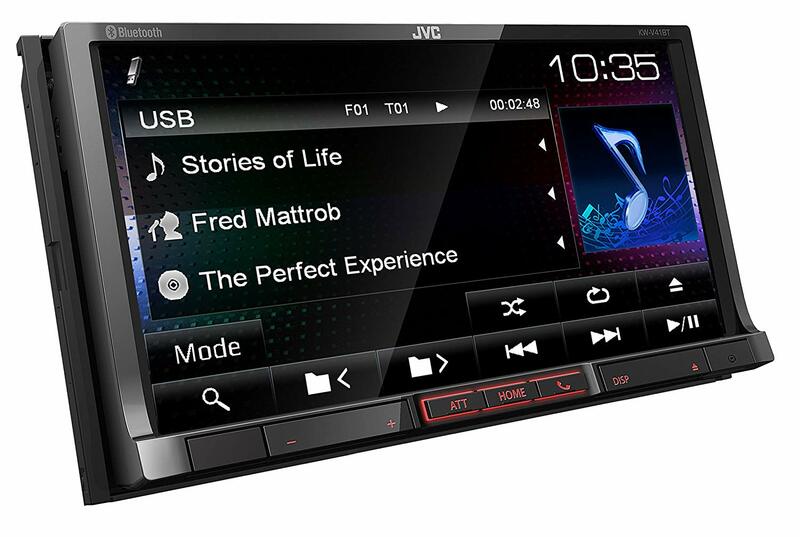 JVC is an industry leader in the manufacturing of car stereo equipment. JVC is a Japanese consumer electronics company and was founded in 1927. JVC, now known officially as JVCKENWOOD​​​​ USA Co​​​​rporation, continues to be an innovative provider of car stereo equipment and as such, the KW-V830BT comes with high expectations. This JVC KW-V41BT review will help you more clearly understand the included features and whether or not they meet your needs. What is the JVC KW-41BT? Is it Compatible With My Vehicle? What makes the JVC KW-41BT Unique? 1 What is the JVC KW-41BT? Is it Compatible With My Vehicle? 2 What makes the JVC KW-41BT Unique? 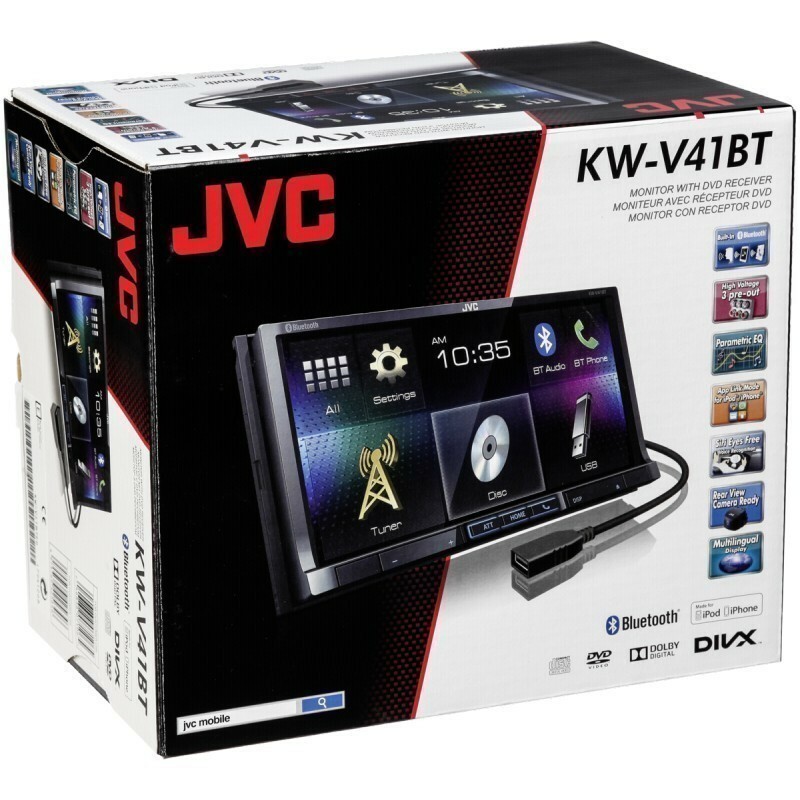 The JVC KW-V41BT is a middle-grade, aftermarket head unit. The unit is a double DIN stereo system meaning that it can only be installed in vehicles with a double DIN stereo opening. Double DIN is simply one of two standard measurements of car stereo head units. Double DIN and single DIN are the two most common sizes of stereo head units. A double DIN head unit is simply twice as tall as a single. The easiest way to see if your car has a double DIN stereo opening would be to google images of the two and you should be able to easily tell. If you feel your eyes are deceiving you, you can measure. A double DIN head unit will be about four inches tall, and a single about two. 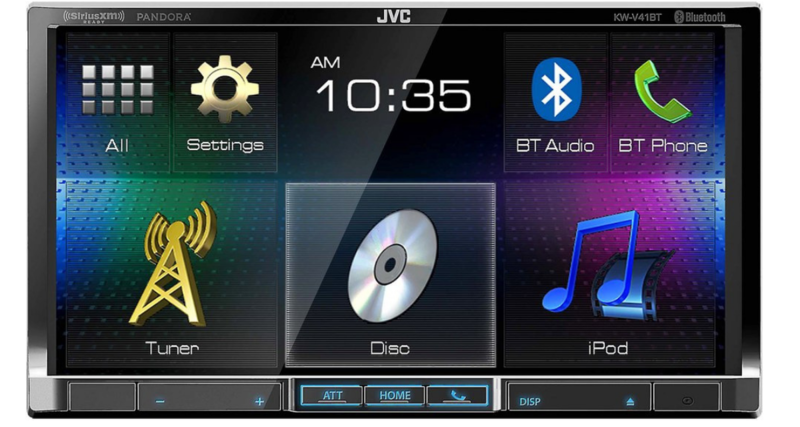 The JVC KW-V41BT is a DVD receiver with Bluetooth technology, a 7 inch touch display, and lots of customization options. Use this JVC KW-41BT review to inform your purchasing decision as the options in this market are near limitless. The JVC KW-V41BT is packed with unique features. Throughout this review, think of your needs and what you feel your existing stereo is lacking. The KW-V41BT offers a uniquely large screen. The screen is seven inches, larger than what is most common in this price range. Many models in this price range offer a 6.2 or 6.3 inch screen. The LCD touchscreen monitor has a resolution off 800 x 400 and over 1 million pixels. Since the screen serves as a control panel, video display, and informational display so it is imperative that you are able to see. The screen is motorized and can be adjusted to avoid glare. Additionally, the disc drive is behind the touchscreen, so the motorized screen will open to reveal that compartment. The touchscreen is equipped with what is known as Monitor Touch Control. This features specifies gestures to control certain aspects of the stereo. For example, a certain gesture on the touchscreen changes the channel or increases the volume. When driving, ease is everything – so this is a welcome feature that is fairly unique to the JVC KW-V41BT. While the screen is impressive, it isn’t everything. The KW-V41BT has Bluetooth technology. Audio streaming and phone functions can all be carried out without any wired connection between your device and your stereo head unit. Phone calls placed and received on a phone connected to the JVC KW-41BT via Bluetooth will play over the car’s stereo system. You can talk back hands-free also as the unit includes a wired microphone. We all recognize how important it is to dedicate your attention to driving while we are on the road, so any feature that keeps your hands on the wheel is valuable. Callers’ contact information and even contact photo will be displayed on the touchscreen. This is another added benefit. Audio from your music library or favorite music streaming app can be played over your car’s stereo without the need for any wires. Play music from apps like Spotify, Apple Music, Pandora, and more. When music is streamed over Bluetooth, the display will not show track and artist information. This particular head unit comes standard with Eyes Free Siri Technology. This means if you are an iPhone owner, you can use Siri over our car stereo system without having to take your eyes off of the road. Questions about location, on-screen notifications and more can be asked and answered safely with this technology. The JVC KW-V41BT does not have Apple CarPlay or Android Auto technology. CarPlay and Android Auto are standard features on many modern luxury vehicles but the technology is often also included in aftermarket stereo head units. Apple CarPlay and Android Auto technology are very similar in function. They are programs designed to mimic a limited version of your smartphone operating system, whether it be Android or Apple, in a specialized way for the car stereo display. This allows many of your phone apps to be manipulated via the touchscreen on the stereo head unit. CNET explains Apple CarPlay and Android Auto a bit further. Again, the JVC KW-V41BT is not equipped with Apple CarPlay or Android Auto, so if smartphone integration is important to you, take notice. The JVC KW-V41BT has some features to supplement its lack of CarPlay and Android Auto, however, that may suit your needs. If you are a Pandora user, you can control Pandora directly through the unit. In fact, if you have an Android device, you can control Pandora wirelessly through the Bluetooth connection. If you are looking for advanced integration for other apps like Spotify, iOS maps, Google Maps, or Waze, you’ll be limited to basic functionality with the KW-V41BT. Another area where the KW-V41BT is lacking is built-in navigation – and by lacking, we mean there is none at all. The best navigation capabilities the KW-V41BT can offer is audible directions played via your favorite GPS navigation app on your smartphone. The JVC KW-V41BT can play many types of media. Audio can be played from a CD, a USB memory device, or through a Bluetooth audio stream as well as the standard auxiliary minijack input. Playable audio file types on this unit are fairly standard but do not included high-res, FLAC files. Audio files are optimized, however, by the unit’s built in 5-band equalizer. For video, the unit has a built in rear A/V input and a rear backup camera input. A backup camera can be easily installed and used with this unit. If this functionality is utilized, when you put your vehicle in reverse, the JVC KW-V41BT will display a live video feed from the rear of the car to the touchscreen display. This makes backing out much easier especially for those who drive very large vehicles. If you are looking to integrate the JVC-KWV41BT into a larger car stereo system, you will likely be interested to know in what ways this unit is expandable. The unit has several outputs. 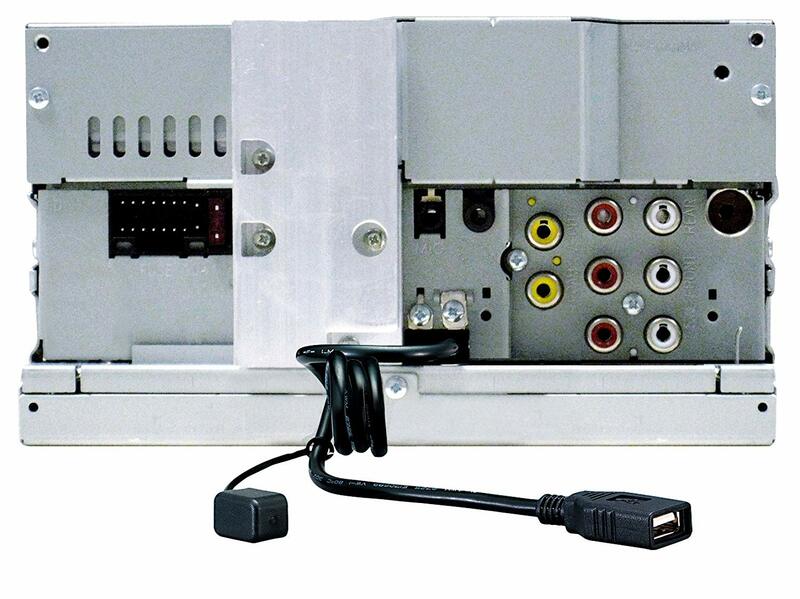 On the rear of the JVC KW-V41BT is an RCA video output and three preamp outputs. This is important for adding additional displays for your passengers and to help added-in speakers sound their best when connected to this head unit. The unit can be connected with a separately-purchased Sirius XM satellite radio tuner to stream satellite radio. Satellite radio is great for areas where traditional radio show signals are not present. For this functionality, you’ll need to buy a subscription to Sirius XM as well as the tuner. External tuners can be purchased for as low as $40 and work right out of the box with this particular unit. With the purchase of an additional adapter, the JVC KW-V41BT will allow you to retain steering wheel controls, like volume adjustment, song seeking and channel skipping, if your car is already equipped with them. The adapter is called a PAC adapter and will vary vehicle to vehicle. The JVC KW-V41BT comes equipped with iDataLink Maestro connective technology, an industry standard, but vital, technology n car stereo manufacturing. iDataLink Maestro is a technology that allows for retention of certain stock vehicle features on your car stereo display and allows your car stereo to display engine performance statistics and important vehicle information on the touchscreen. Retailing for around $254.99, the KW-V41BT has high expectations to meet. This is a low price in the realm of double DIN stereo head units, but the KW-V41BT is arguably not feature-rich. While the price is very affordable and the unit is capable of carrying out most of the basic functions you’d expect, there are other similarly priced units that will have expanded capabilities like built-in navigation and modern smartphone integration technologies. Reviews of the JVC KW-V41BT are typically a mixed bag. Some users are very pleased with the bare-bones functionality while others desire a bit more from their stereo head unit. Let’s take a look at one JVC KW-V41BT review from a verified purchaser who complemented the unit steadfastly. Some other reviewers are not as enthusiastic about their buy. “Purchased the head unit to replace the OEM unit while gaining Bluetooth and other features. The unit fit the vehicle like a glove and no modification to the vehicle was required. Great unit, sounds excellent and once you understand the wiring set up pretty straightforward to install. The JVC KW-V41BT has a lot of room for improvement. In terms of being “state of the art” the KW-V41BT is blown out of the water by many similarly priced head units, like the Jensen VX7021 which boasts included map databases, GPS navigation capabilities and more impressive sound quality. The JVC unit has no GPS navigation capabilities or advanced smartphone integration. Additionally, there is nothing extraordinary about any of the technical specifications. However, it must be noted that the unit does receive a good amount of positive feedback from satisfied customers. Many looking for a decent touchscreen stereo head unit for basic functionality manufactured by a trusted brand will be pleased with the JVC KW-V41BT. The bottom line is that purchasing a new stereo head unit is all about understanding your personalized needs. If you need a top of the line, full-featured car stereo, it’s best to leave this unit out of your system. This head unit never claims to be top of the line, and that’s what many people are attracted to about it. However, it’s clear from this JVC KW-V41BT review, that the unit has plenty to offer for the price range it’s in. For reliable Bluetooth audio streaming, playing CDs or DVDs, and listening to satellite radio, the JVC KW-V41BT is worth looking into. The KW-V41BT is a 7' Motorized Touch Screen Monitor Bluetooth/DVD/USB Multimedia Receiver system. You can display up to 20 compatible apps on-screen ranging from Navigation to Music to Driver assistance apps using an optional adapter. However, the JVC KW-V41BT has no GPS navigation capabilities or advanced smartphone integration.